Chicago, IL .. “It’s a valuable addition to our research library,” said Frank Milewski (left) who currently heads the Holocaust Documentation Committee of the Polish American Congress. 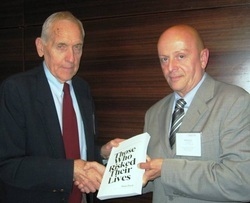 Shown with him is Mariusz Szajnert, president of the PAC’s Michigan Division, who used the organization’s semi-annual National Director’s Meeting in Chicago as an opportunity to present a copy of “Those Who Risked Their Lives” to Milewski. The Holocaust Documentation Committee is based in New York. The book is a compendium of statistics and stories written by both Jews and their Polish rescuers. It describes the incredible extent to which these rescuers went to hide and protect their Jewish neighbors from being hunted down and murdered by the Nazis during the German occupation of Poland in World War II. Unlike the other European countries under German control, the Nazis made it official and very clear to Poland’s Christians that any form of help they gave the Jews would be punishable by death. Despite such a bone-chilling threat directed at the Poles, many of them defied the warning and offered the Jews the help they begged for. There were also many the Germans killed for violating this official order. Even worse, the Germans often murdered the entire family of these “Good Samaritans.” Sometimes even their next door neighbor. Sometimes those who lived on the same floor of the apartment house. The Jewish Talmud states that “he who saves one life saves the world.” In gratitude for such selfless sacrifice, Israel honors these ”Righteous” at its Yad Vashem Memorial in Jerusalem. Among the heart-wrenching accounts in “Those Who Risked Their Lives” is the story of the 14-member Kosior family from the villages of Ciepielow and Rekowka. They were among the 33 victims herded into a barn and burned alive in accordance with the automatic death penalty for anyone protecting Jews. The Polish American Congress formed its Holocaust Documentation Committee more than twenty years ago when the U.S. Holocaust Memorial Museum in Washington, D.C. began compiling information about concentration camp survivors and rescuers of Jews prior to its opening in 1993.